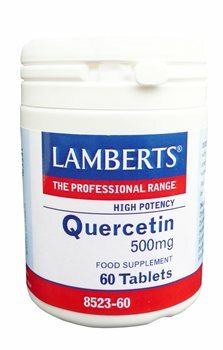 Quercetin is one of the most active flavonoids, with many medicinal plants owing much of their activity to their high quercetin content. Quercetin Dihydrate, Calcium Carbonate, Cellulose, Tablet Coating (hydroxypropyl Methylcellulose, Glycerin), Stearic Acid, Silicon Dioxide, Crosslinked Cellulose Gum, Magnesium Stearate. Do not exceed recommended daily dose. Food supplements should not be a substitute for a varied diet. Do not take if pregnant or breast feeding. Suitable for vegetarians.